Pansy's are such a cheerful little flower with their happy little faces and bright colours. 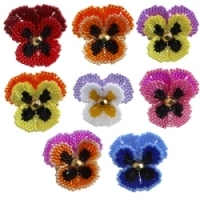 This patten has been designed so you can choose whatever colour combination your favorite Pansy is! Only a small amount of delica beads are required, so this is a great project for using up your bead stash. This makes a great present for female relatives and with Mother's day just around the corner this would make an ideal gift! As usual with ThreadABead featured patterns we give full detailed photographic instructions and in this pattern there are 56 detailed steps, making this pattern even suitable for beginners to beading. This pattern is made using Japanese Miyuki size 11 Delica beads and Brick Stitch is used. It is assumed the beader will be familiar with Brick Stitch, however full instructions are inclued. Please note the pattern may not work with any other size and type of beads. There is 3-5 delica colours in total and the finished beadwork is approximately 3.2cm x 3cm. 1 x 2-Hole 20mm Brooch Finding and 1 x 6mm Gold Plated Firepolished bead are also required. The bead pattern supplied is 22 pages and includes a colour chart of suggested delicas, and 56 step by step colour photo instructions.